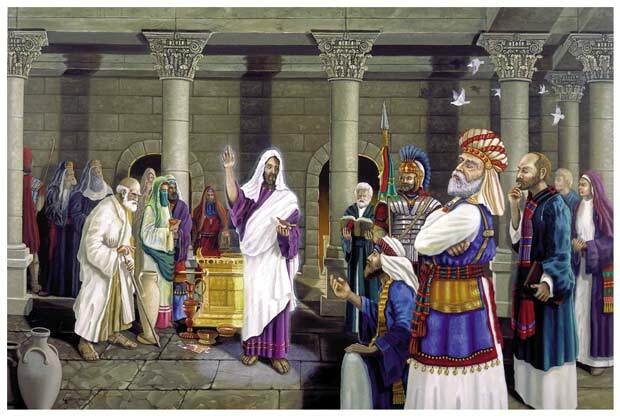 After Jesus received a kings welcome when he arrived in town, and created a prophets scene at the temple the ruling religious leaders were unhappy. They were in charge of one of the greatest temples, in one of the greatest cities, during the most important celebration of the Jewish calendar. But who was getting all the attention; some back woods preacher who didn’t seem to have enough sense to know whom he was messing with. But Jesus wasn’t in Galilee anymore he was in their play ground and the time had come for them to show Jesus who really ran the religious show in Israel. I find Tuesday to be such an exciting day in Holy Week. Jesus lets the parables fly left and right, he predicts the destruction of the temple, and the end times and of course he has a show down with the religious elite. I know some people zoom right into the end times prophecy, but I just can’t turn away from a good debate. The Sadducees, the Pharisees and the Herodians were all out to get Jesus. But before they turned to violence they tried to use words. Jesus had brought the fight right to their front doorstep, and they wanted to discredit him in front of the crowd. So they had a line up of theological puzzles for Jesus to solve. First it was a question concerning Jesus’ authority, the next question involved paying tax to Caesar, then it was marriage and the resurrection, and finally Jesus was asked about the greatest commandment. Each time a question was asked, I am sure the questioner had a look of smug arrogance. They were sure that they had Jesus backed into an intellectual cornered. They were sure, if he could answer at all, that there was nothing he could say that wouldn’t either infuriate the crowds, or allow them to charge Jesus with blasphemy. But that didn’t happen. For every question asked Jesus was able to readily supply an answer. The crowds were delighted, it was the Sadducees, Pharisees and the Herodians that left infuriated. As I reflect on this story I cannot help but wonder if the same can be said about Jesus’ followers now. Are we equally up to the task of answering our critics puzzles? Are we ready at a moments notice to debunk myth, to show where scripture is being misinterpreted, and to unravel theological puzzles? Is there any question right now that you dread the thought of a non-Christian asking you? I bet there is at least one. How could there not be. There are so many hot topics out there right now when it comes to faith and religion. If it is not science, it is womens rights. If it’s not womens rights, its use of money. If its not money, its the environment. If it is not the environment, it is sexuality. And on and on we can go. So as you settle into Holy Tuesday take some time and look up the answer to that one question you’ve always wanted to know. Who knows the answer may surprise you. The parade is over. The crowd has dispersed. 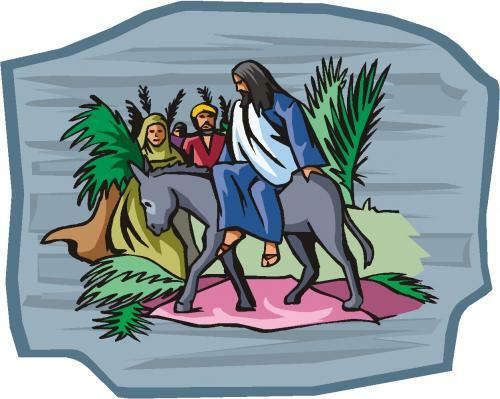 What will one day be known as Palm Sunday has come to a close. The evening is setting in, and Jesus stops by the Temple before heading back to Bethany for the evening. Evidently Jesus did not like what he saw. And what did Jesus see? He saw tables filled with temple approved currency. He saw cages full of pre-approved livestock for sacrifice. He saw table after table filled with must have merchandise for the Passover Pilgrim. He saw lots of space dedicated to shoppers, and to merchants which left no space for worshipers. 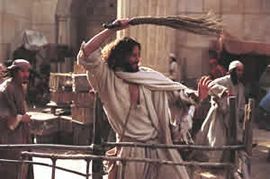 So what was it about the temple that made Jesus so mad? Pilgrims were supposed to be coming to Jerusalem to encounter God, not be gouged. They were supposed to be coming to worship not to shop. They came to bring their offerings, make their sacrifices, sing songs and pray prayers. But what the encountered were people out to make a profit. The pilgrims were told the animals they brought were not pure enough, but they needn’t worry the merchants had just what they needed, at a premium price tag of course. Likewise the money they carried, money from the countries they lived that was stamped with images of rulers or gods from those lands, well that couldn’t go into the temple’s coffers. Thankfully the money changers were there to help take care of that problem, for a fee of course. Jesus would have none of it. People wanted to worship God so Jesus removed the obstacles preventing them. While it is odd for me to picture Jesus this way I like the idea that he wanted to clear a path for people to encounter God. I have been to very few churches that actually set up tables filled with things that have to be bought before people are allowed to enter, but that doesn’t mean we don’t set up obstacles. Do we sneer at the single mother with a squirmy child? Do we cast glances at the person who walks in with shabby clothes? Do we constantly use words that no one outside of the church understands. All of these things and more scream you do not belong here. Which makes them tables that need to be flipped in our churches.